Use the things laying around and transform them into neat looking centerpieces in your yard. 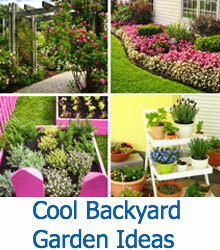 Here are some Recycled Items for your Garden you can do. We’re excited to show you how you can use anything laying around your home and transform them into attractive looking centerpieces in your own yard. 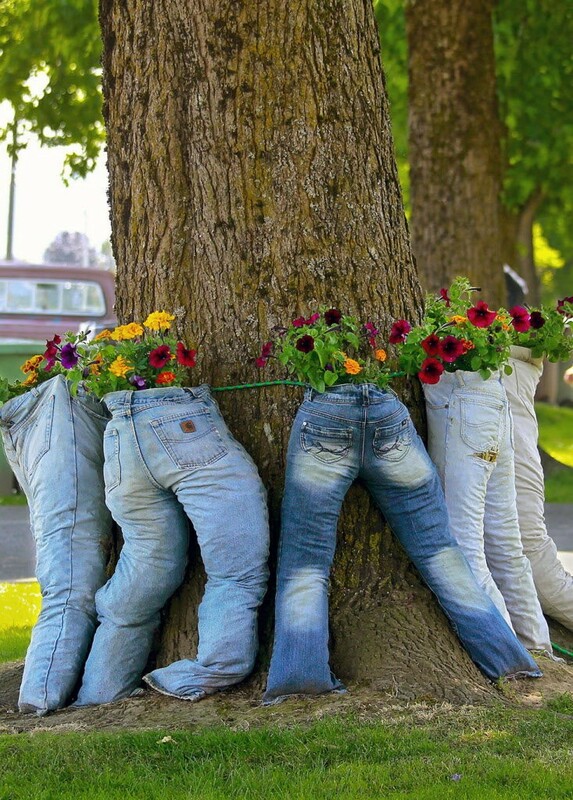 Here are some of our favorite recycled items you can use to beautify your garden. 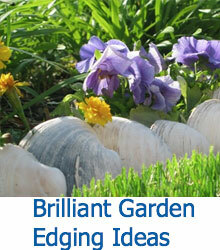 We all know that gardens are a wonderful way to add beauty to any urban or residential environment. Both home and public gardens create essential green spaces that help you connect with nature, provide a serene place to spend time outdoors, and, depending on what you grow, even provide food and herbs to use in your home cooking. While we were thinking about the best ways to live as green as possible, we considered the best ways to spruce up your garden with the use of repurposed and recycled materials. It’s a win-win situation because you’ll get to remove clutter from the home, or someone else’s home, while bringing a novel touch to your garden. Whether you’ve got a lot of unused items lying around, or you know where all the best yard sales and thrift shops can be found, this gallery is your ticket to inspiration in the garden. With some old items, a lot of creativity, and a little elbow grease, you can give your garden a facelift while doing your part to protect the environment. 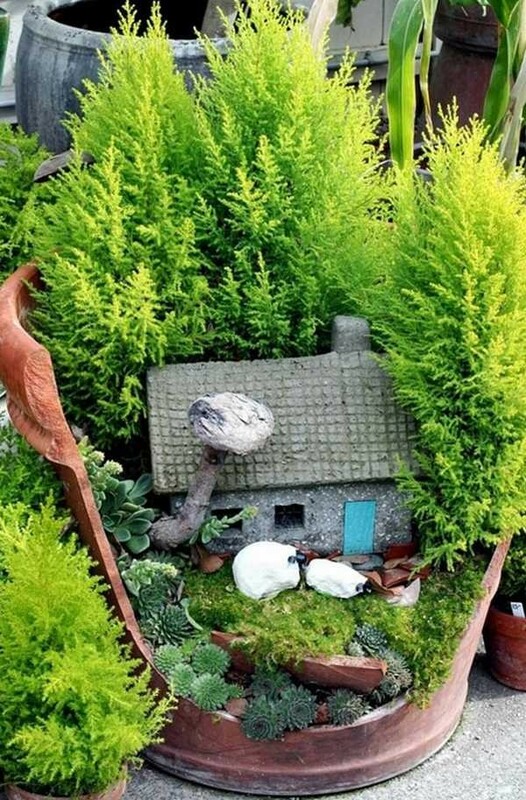 There’s no sense in throwing useful things away when you can instead add a sense of whimsy and fun to your favorite garden space! 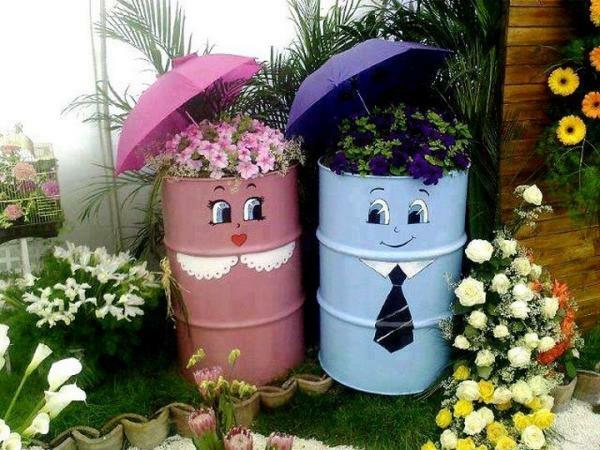 This adorable “his and hers” set of painted barrels make a great place for color-coordinated flowers and umbrellas, and adds the cute personal touch of this gardening couple. 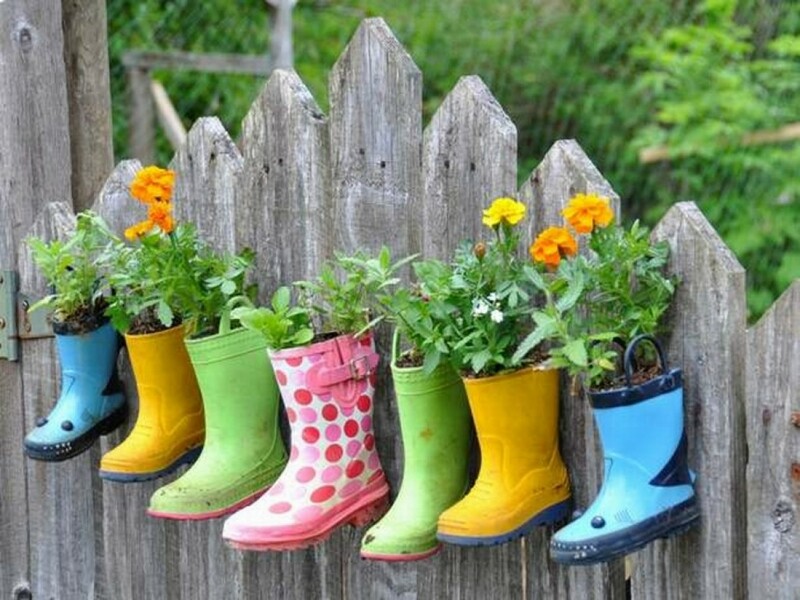 Incorporate brightly colored rain boots into your garden by hanging them from a fence! This helps make this clever decoration even more visible and can create a little garden of its own if you have limited space to work with. Use matching pairs you’ve grown out of or that one rain boot without a mate. 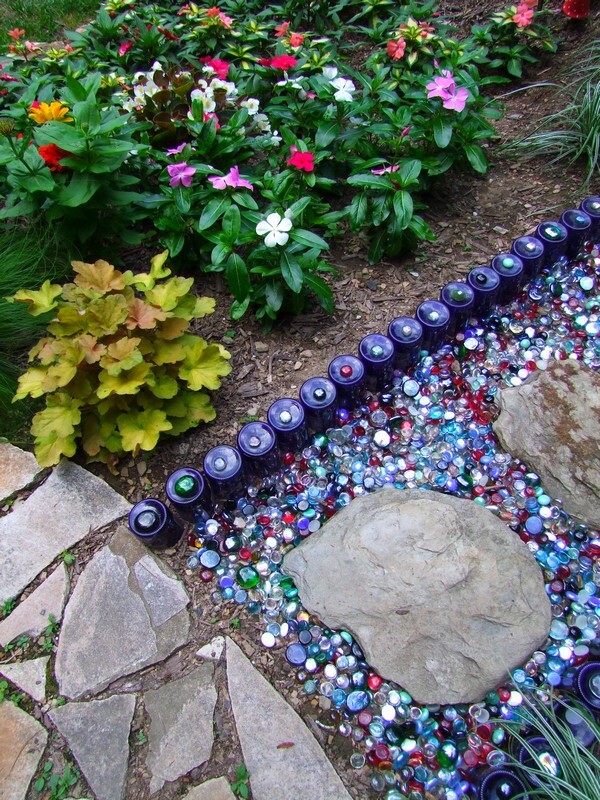 Glass bottles can be used to line pathways or flower beds to add color and decor to your garden without breaking the bank. Blue and green glass bottles work best! 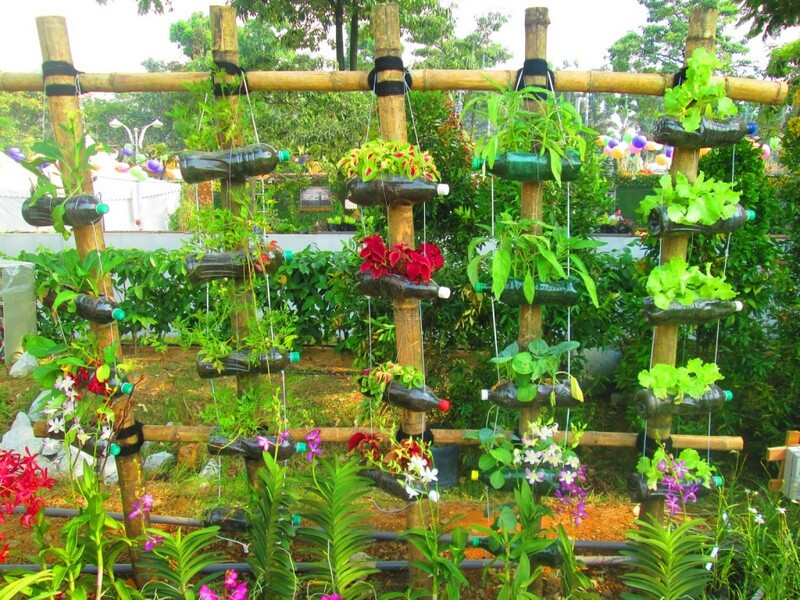 For another clever way to reuse bottles, turn the plastic ones into hanging planters! 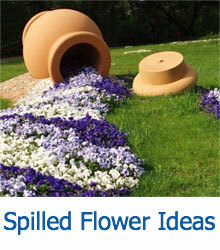 Simply cut out the side and fill with soil to create a home for small plants and flowers. Broken pots don’t have to be useless! With a little creativity, a busted up flower pot can become a cute little diorama – a garden within your garden! 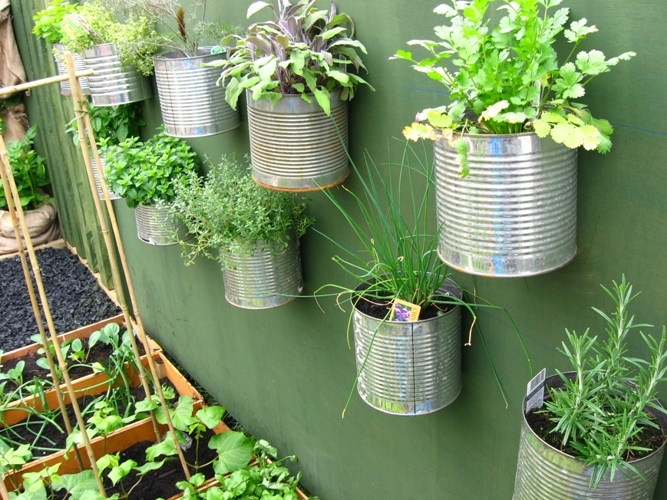 Old cans make great hanging planters, either to save space or to nurture your little sprouts until they’re ready to be transplanted. 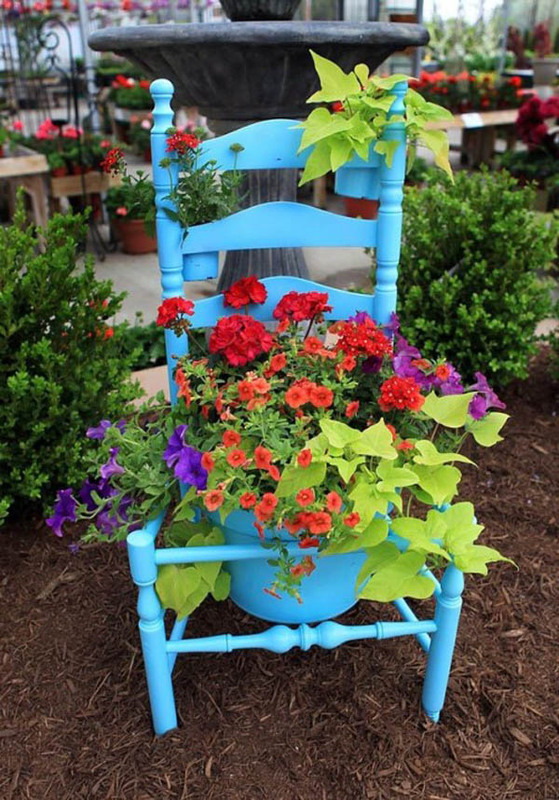 An antique chair without a cushion makes for a great flower pot holder, and can be easily painted to match the aesthetic of your choice. Even if it isn’t sturdy enough to sit in, it can still make a lovely addition to your garden! Have a pair of old jeans that don’t fit? Too beat up to wear? Instead of throwing them away, fill them up with mulch and soil and turn them into a unique plant holder! Pallets are incredible versatile, and most businesses simply throw them out after unloading them. 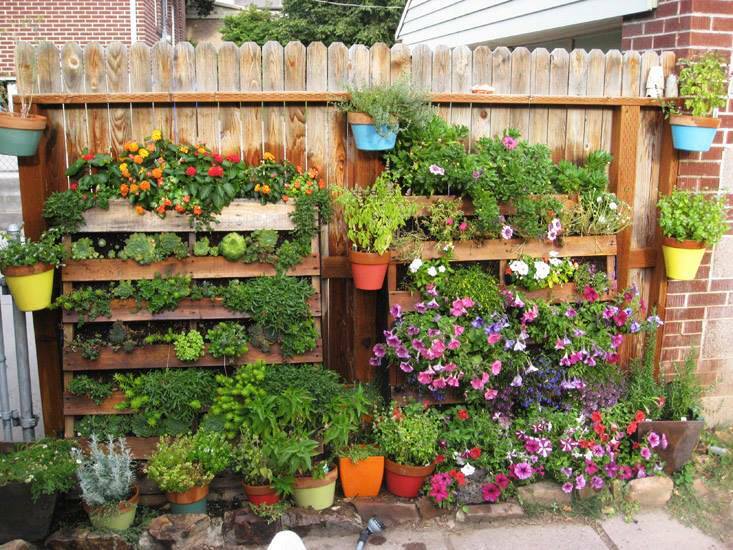 You can repurpose these wooden treasures in to shelving for potted plants, or convert them into rowed planters for flowers, herbs, and more! 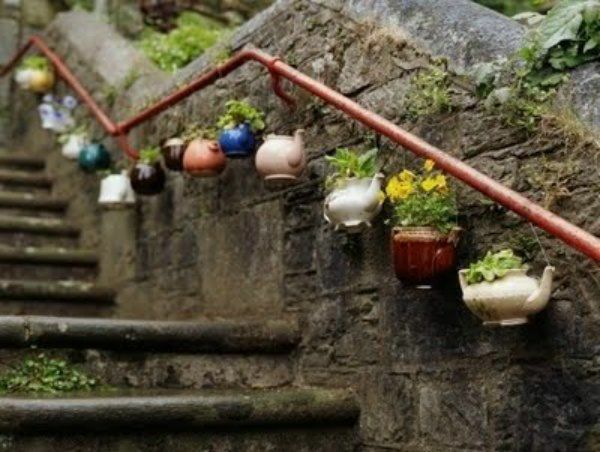 This creative use of variously sized flower pots shows just how creative you can be! 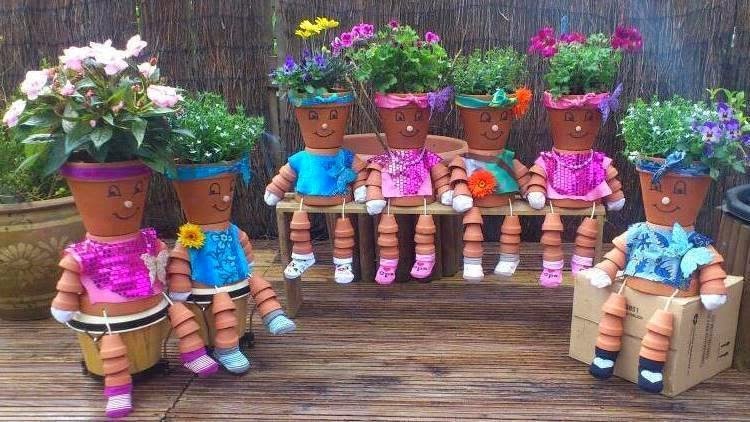 If you aren’t using all of your flower pots, experiment with other uses – like making this cute figures! 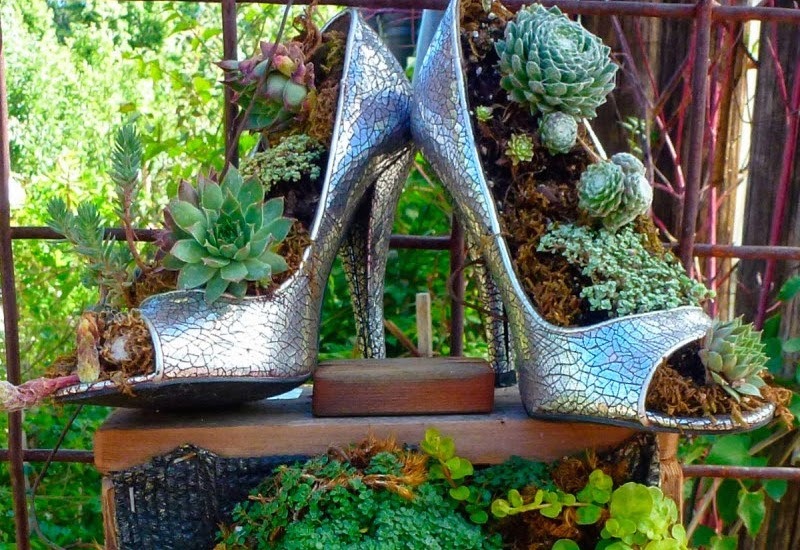 These open-toed heels make a great bed for moss and small plant life, and add an element of class to any garden. Instead of throwing out the shoes that don’t fit, turn them into decorations. 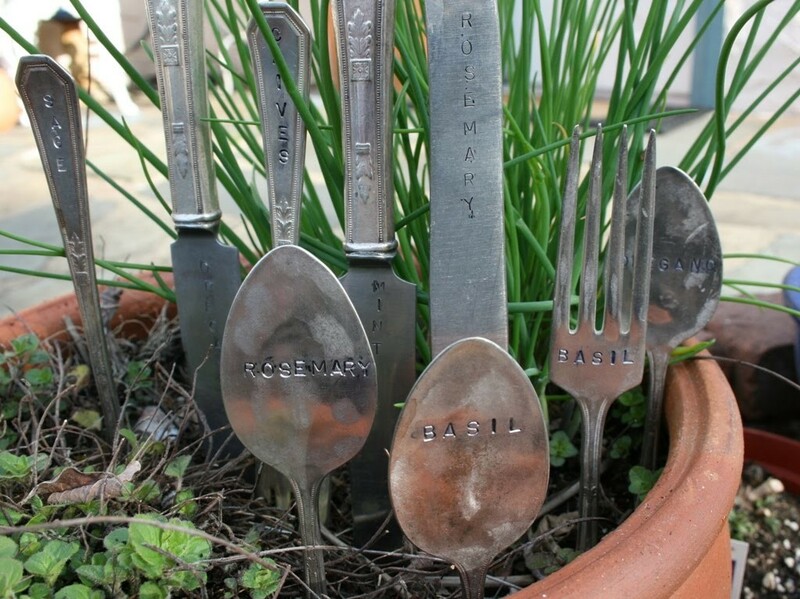 With just a little bit of metal stamping, you can turn old silverware into unique and stylish tags for your plant life! This is a great way to identify your herbs, flowers, and vegetables without relying on those store-bought cardboard markers. Old tea kettles can be found in closets and thrift stores everywhere, but instead of letting them collect dust, use them for unique hanging flower pots! Each kettle has it’s own look, and you can even match it with the flowers you plant! 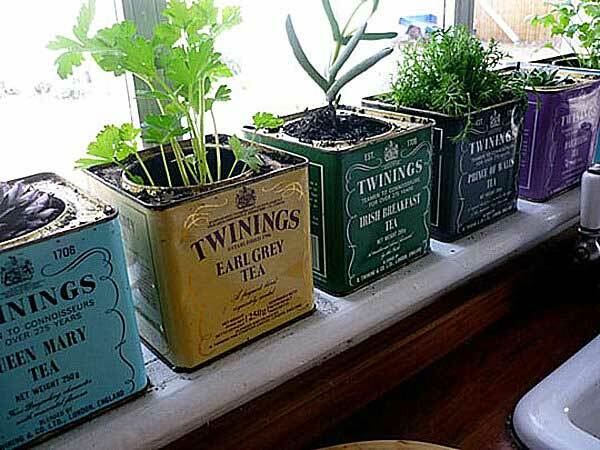 Tea tins, especially of the antique variety, make for great little indoor planters or temporary holders for seedlings. You can use them to combine a vintage aesthetic and the natural beauty of plant life. 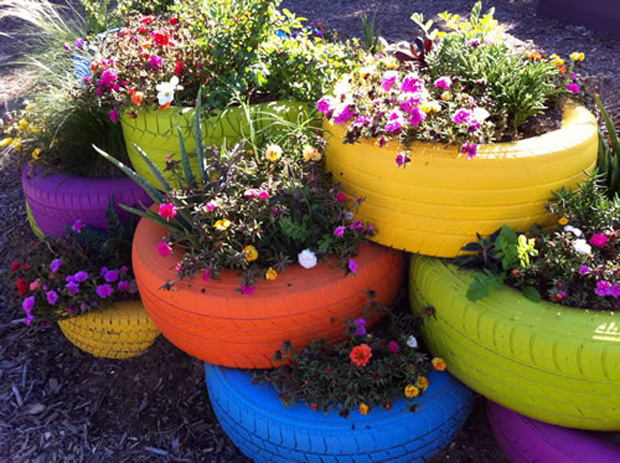 Old tires are usually seen as nothing but waste, but with a little paint and a creative eye, they can be transformed into colorful, stackable flower beds!